We’re ready for barbecues, vacations and everything in between. As the temperatures start to reach their peak, it’s about time to enjoy the best of what summer has to offer, like fresh corn, tomatoes, basil and lazy afternoons grilling with your family. Our grilled mixed bean salad recipe is incredibly healthy, with just half a tablespoon of olive oil to coat your vegetables and help them get gorgeous color and grill marks. It’s an entirely vegan, gluten-free bean recipe bursting with flavor. The lemon juice here adds amazing brightness to the dish and wakes up the sweet flavors in the corn and tomatoes. Make sure you don’t skimp on the fresh basil; its earthiness makes a huge difference, and dried basil, while it has its own uses, just isn’t a good substitute. If you worry about buying a big bunch of basil and not using it fast enough, you can extend its life for several weeks with a few simple steps. Essentially, treat your basil like you would fresh flowers. When you get home, trim the tips of the stems. Put them in a glass or vase of water and cover it with a plastic bag with air holes poked throughout. You’re creating a handy little terrarium that keeps your basil alive longer so you can get the biggest bang for your buck. This will work with any leafy herb like parsley, cilantro or mint. Enjoy your mixed bean salad on its own as a hearty vegan entree or try it alongside grilled chicken or light, flaky fish. Take two large sheets of foil and prepare a foil packet for the beans. Drizzle with olive oil, salt and black pepper and mix together. Seal the packet and use a toothpick to poke a dozen holes into the packet so that the smoke from the grill can get to the beans. Set on the grill for 20 minutes or until warmed through. Grill the corn about ten minutes or until it gets the color you want on it. Grill the tomatoes and zucchini for a few minutes on each side. Remove the beans from the foil packet and place into a large bowl. 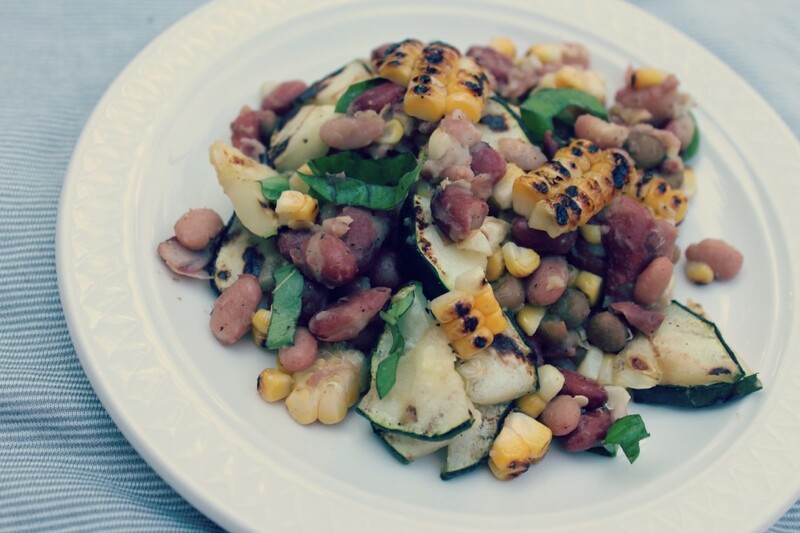 Cut the corn off the cob, slice the zucchini and tomatoes into smaller pieces and add them to the beans. Chop the basil and add it to the salad along with the lemon juice and stir until incorporated.